This law was the first to designate which of two Australian flags is the national flag. Schedules to the Act give the specifications for the blue national flag and the red merchant shipping flag. In August and September 1901 judges appointed by the Commonwealth government worked through over 30 000 competition entries to select a design for two Australian flags – one with a blue ground for official use, the other with a red ground for merchant ships. The judges, representing naval and shipping expertise, chose a design for these flags as submitted in five of the entries. The blue flag was first flown from the Exhibition Building Melbourne on 3 September 1901 when the winning design was announced – this was a huge flag (36 by 18 feet), made to order for the occasion. 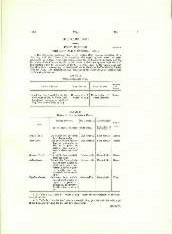 King Edward VII's approval of the chosen design, slightly simplified, in 1902 was gazetted in February 1903. 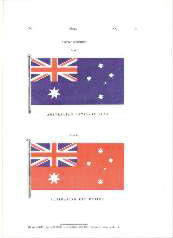 In June the same year the Admiralty authorised the flying of the red merchant flag on ships registered in Australia. 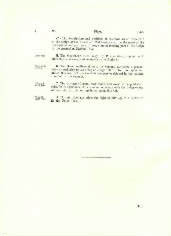 (From February 1922, when the Navigation Act 1912–20 took effect, this was compulsory.) The design was further modified in 1908 to give the Commonwealth six-pointed star (each of its points representing a State) another point to represent Papua and any future territories, making it consistent with the star in the Commonwealth Coat of Arms authorised that year. The Commonwealth Government, at the time the design was approved in 1901, regarded the two Australian flags as colonial flags, with the Union Flag, usually called the Union Jack, continuing to serve as the national flag. Within the British Empire, blue and red flags (called ensigns) served primarily to identify ships at sea – the blue indicated a government ship and the red a privately owned vessel. That is why the British Admiralty controlled their design. Only after pressure from Australian nationalists, especially Richard Crouch, Member of the House of Representatives, did the Commonwealth government begin to use the blue Australian flag for Australia's naval forces in 1903. After the House of Representatives passed a special resolution in June 1904, the blue flag was also flown from post offices and Commonwealth buildings in Melbourne and Sydney on national occasions. However, that flag did not replace the Union Flag on forts until 1908, and on the jackstaff on the bow of warships until 1911. Despite these changes in the regulations, the Australian flag was sometimes overlooked. Its absence at the ceremony at Fremantle to welcome the arrival of the first Australian cruiser from Britain in 1913 caused an outcry by nationalists. The Commonwealth government's reluctance to use the Australian flag also reflected disapproval of its design. At the time of its selection in 1901, some critics, especially in New South Wales, thought the design too similar to Victoria's flag, as the designers had simply removed the crown above the Southern Cross constellation on the Victorian flag and added the Commonwealth star. Many of those critics preferred a flag widely used in eastern Australia during the 19th century, which had become an important symbol in the Federation campaign. This British white ensign featured a blue cross bearing white stars. Edmund Barton had in 1898 persuaded the Federal Association of New South Wales to recommend this flag as the flag of the new Commonwealth. As the first Prime Minister, Barton forwarded this design, as well as the winning design from the competition, to the British government. Later Prime Ministers, John C Watson from New South Wales and Andrew Fisher from Queensland, also thought the selected design unsuitable. The First World War popularised the use of flags, especially Australian flags, on land. More people also wanted to put Australian flags in state schools, where the Union Flag had largely flown unchallenged since Federation. There was widespread confusion about which was Australia's national flag – the Union Flag or an Australian flag. In the volatile politics of post-war Australia, an Australian flag, unless accompanied by a Union Flag, became a symbol of disloyalty, since the Union Flag was widely regarded as the national flag. That was the flag used to cover the coffins of Australia's most popular war heroes, Sir John Monash and Albert Jacka VC, in 1931 and 1932. There was also confusion about which Australian flag – the red or the blue – could be used by various levels of government and by the people. In 1924 the Commonwealth government, after much indecision, advised State governments that the Australian blue flag was for Commonwealth use only. Protest forced reconsideration of the issue, and the concession that State governments could use the Australian flag if State flags were not available. However, private organisations and individuals, and even state schools wishing to use an Australian flag were expected to use the red one. Strangely, the official painting of the opening of Parliament House in 1927 features the red Australian flag. The Victorian Government challenged this direction in relation to State schools in 1938, and, unable to get a response from the Commonwealth, legislated in 1940 to allow schools to fly the Australian blue flag. This increased pressure on the Commonwealth government led it to announce in 1941 and again in 1947 that there was no longer a restriction on the use of that flag. Finally, when arrangements were being completed for the presentation of an Australian flag to every school as part of the Commonwealth Jubilee celebrations in 1951, a decision had to be made as to whether that flag would be blue or red. 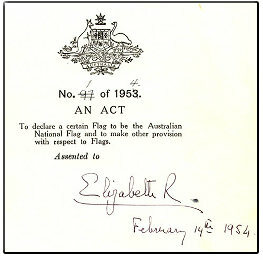 The Menzies Government in December 1950 proclaimed the blue flag as the Australian national flag, and subsequently prepared the legislation which became the Flags Act 1953. The Prime Minister expected that the practice of flying the Australian flag and the Union Flag together on national occasions would continue. He also ensured that Section 8 of the Act maintained a person's 'right or privilege', defined in Britain in 1908, to fly the Union Flag. Kwan, Elizabeth, 'Blue over red: Australia's Victorian flag legacy and Menzies' decision', Crux Australis, vol. 13/4, no. 56, February 2000, pp. 158–75. Kwan, Elizabeth, 'Flags', The Oxford Companion to Australian History, Graeme Davidson, John Hirst, Stuart Macintyre (eds), Oxford University Press, Melbourne, 1998. Kwan, Elizabeth, 'The Australian flag: ambiguous symbol of nationality in Melbourne and Sydney, 1920–21', Australian Historical Studies, vol. 26, no. 103, October 1994. This document, passed by Parliament in December 1953, was one of the few Commonwealth Bills to be signed by the Monarch rather than the Governor-General. Unlike most of those Bills, this one did not legally require the Queen's assent: Australian flags no longer needed British authorisation. However, the Menzies Government decided to invite Queen Elizabeth herself to sign the document during the 1954 Royal Tour of Australia. Her signature would validate the transition in national flags which was taking place, from Union Flag to Australian national flag. 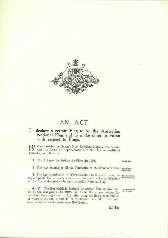 Though the Act is numbered 1 of 1954, it is cited as the Flags Act 1953 – rather confusing, but this document reveals the simple explanation. The Bill was renumbered – the first page shows the correction - and the Governor-General, Sir William Slim, instead of giving his assent as usual in place of the Queen, signed his statement, 'I reserve this Act for Her Majesty's pleasure'. Strictly speaking the document was not yet an Act: in our constitutional monarchy a Bill does not become an Act until it receives the Assent of the Monarch or her appointed representative. 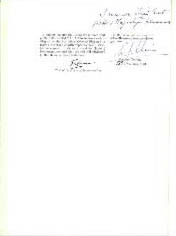 Queen Elizabeth signed this document, and the duplicate assent original for the House of Representatives, on Sunday 14 February 1954, the day before she opened the next session of the Commonwealth Parliament. The document has four pages, measuring 27.2 x 21.1 cm: the Act, and two Schedules on glossy paper, illustrating the flags in colour. Signed and dated by Queen Elizabeth II, it was kept in the Office of the Governor-General until transferred to the National Archives. 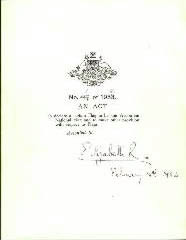 Queen Elizabeth II's signature can be seen on the cover of the Flags Act 1953 (Cth).